The Shortwave Report 06/23/17 Listen Globally! Read more about The Shortwave Report 06/23/17 Listen Globally! On the 12th of June, the United States Court of Appeals for the Ninth Circuit refused to reinstate the revised version of Trump's Muslim ban/travel ban. It didn't help Donald Trump that he had opened his mouth on Twitter to say things contradicting the legal arguments for his "revised" travel ban. The Shortwave Report 04/21/17 Listen Globally! Read more about The Shortwave Report 04/21/17 Listen Globally! The Shortwave Report 04/14/17 Listen Globally! Read more about The Shortwave Report 04/14/17 Listen Globally! On Friday, March 23, CNN released a report detailing a chillihng pattern of ICE raids aimed at sanctuary cities to pressure them to let ICE fish in their jails, and in one case to retaliate against Sheriff Sally Hernandez's in Travis County, TX for instituting a sanctuary policy. DC is still a sanctuary city according to Mayor Bowser herself, so similar assaults on immigrant communities here are possible. Read more about The Shortwave Report 03/24/17 Listen Globally! On the 21st of March, over 60 congregations came together to launch the DMV Sanctuary Congregation Network. 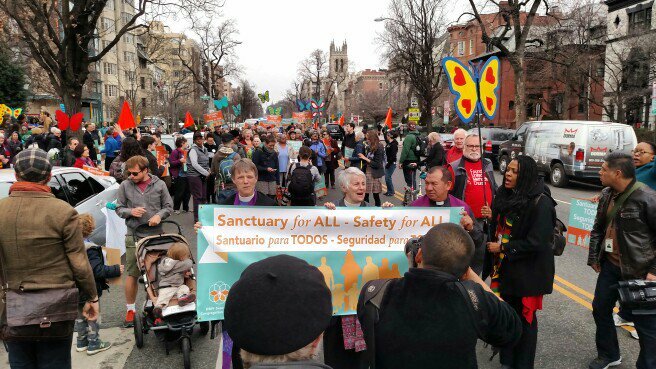 They gathered at Foundry United Methodist Church and marched down 16th st to the White House. Read more about The Shortwave Report 03/17/17 Listen Globally! The Shortwave Report 02/24/17 Listen Globally! Read more about The Shortwave Report 02/24/17 Listen Globally! The 16th of February became the Day Without Immigrants as a nationwide general strike shuttered restaurants and other businesses that rely on immigrant labor. 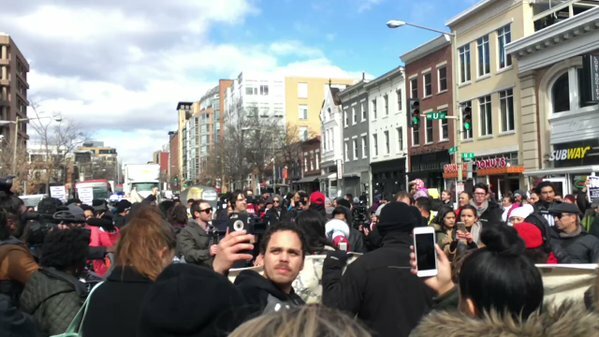 Here in DC the Washington Post published a long list of closed restaurants and a noontime march filled the streets.